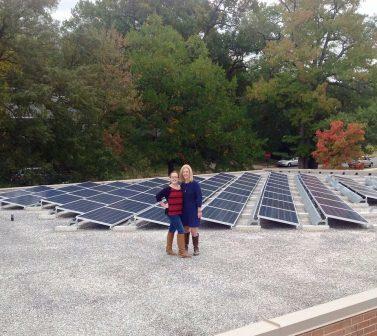 MEA Director, Abigail Ross Hopper stands on the roof of University Park Elementary School with her daughter. Director Hopper is an alumna of the school and spoke at the solar array dedication on October 19, 2013. Maryland’s solar market continues to grow. Today our state now has well over 1,519 times the amount of solar energy on our grid than it did in 2007. Many Maryland schools have begun harnessing the power of the sun to provide power for their facilities. Thanks in part to a Maryland Smart Energy Communities program grant, University Park Elementary in University Park, Maryland recently became the first Prince George’s County School to go forge a partnership with their community and construct a community solar array on school grounds. “This successful installation is a terrific example of a public-private partnership that delivers multiple benefits to the community, and we are pleased to be part of it!University Parkis proud to be the member of a partnership that delivers real revenue to the community, educational benefit to students and parents and economic benefit to small business,” noted University Park Mayor John Tabori in the project’s press release on October 7, 2013. The 216-panel array has already begun to generate towards its annual capacity of 85,000 kilowatt hours, and will reduce greenhouse gas emissions by 60 tons per year compared to conventional power sources. During the array’s 25-year life span, it is expected to generate enough electricity to power 225 homes and reduce greenhouse gas emissions by 1,500 tons. The entire energy-saving project cost $200,000 through a partnership between the Prince George’s County Public School (PGCPS) system and the town of University Park. A majority of the project obtained funding through a United States Department of Energy grant to the Town for the Small Town Energy Program (STEP) while an additional $37,500 came from the Maryland Smart Energy Communities program.Rockville based, Standard Solar, installed the solar array which is expected to provide an estimated $16,000 in annual revenues from the sale of electricity and solar renewable energy credits (SRECs) which will be shared between the PGCPS and University Park.